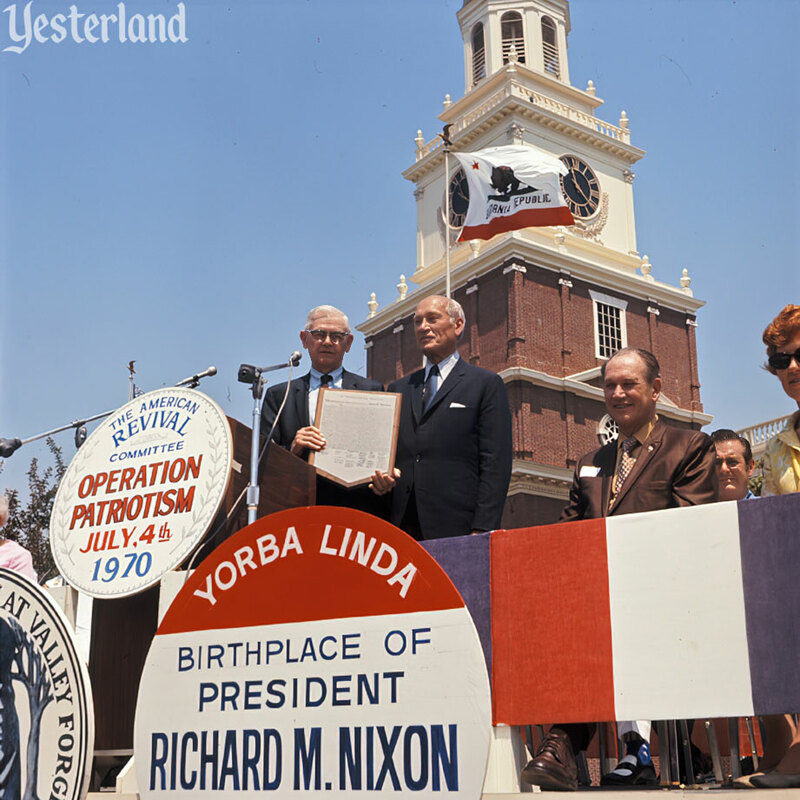 Hardly anyone noticed a significant milestone in theme park history earlier this month, on July 4, 2016—the Quinquagenary (50th anniversary) of Independence Hall at Knott’s Berry Farm. This isn’t a “Yester” article about something that’s gone. 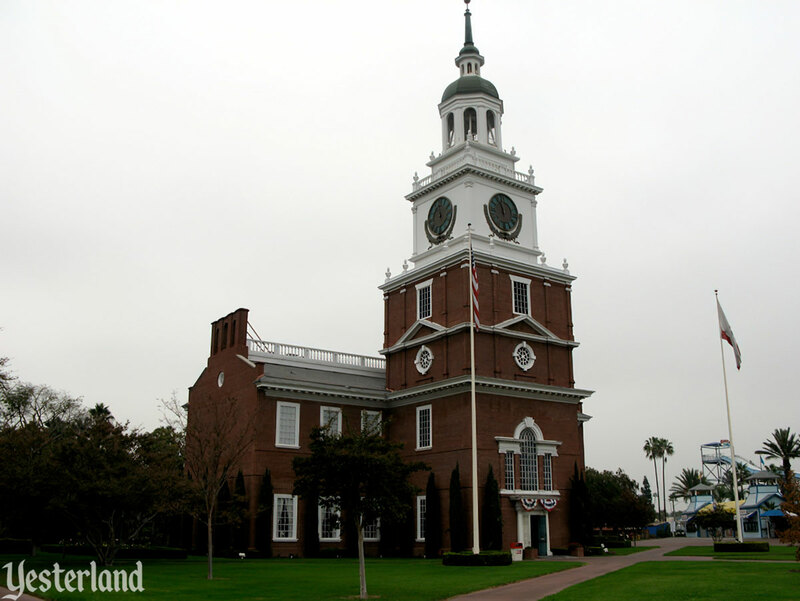 You can still visit Independence Hall at Knott’s. And you really should. Twenty days later, Walt Disney would preside over the dedication of New Orleans Square at Disneyland, but today the spotlight was on Knott’s Berry Farm. 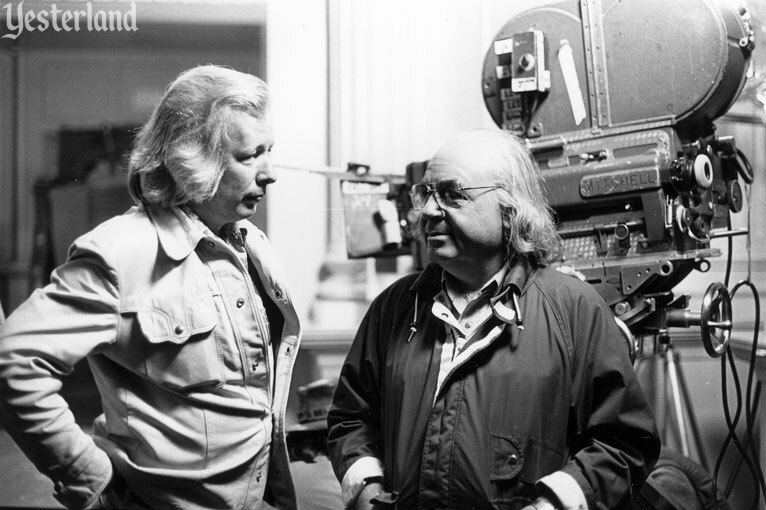 So why did Walter Knott build Independence Hall? I have been asked this same question many times about Ghost Town since we started building it more than a quarter of a century ago. 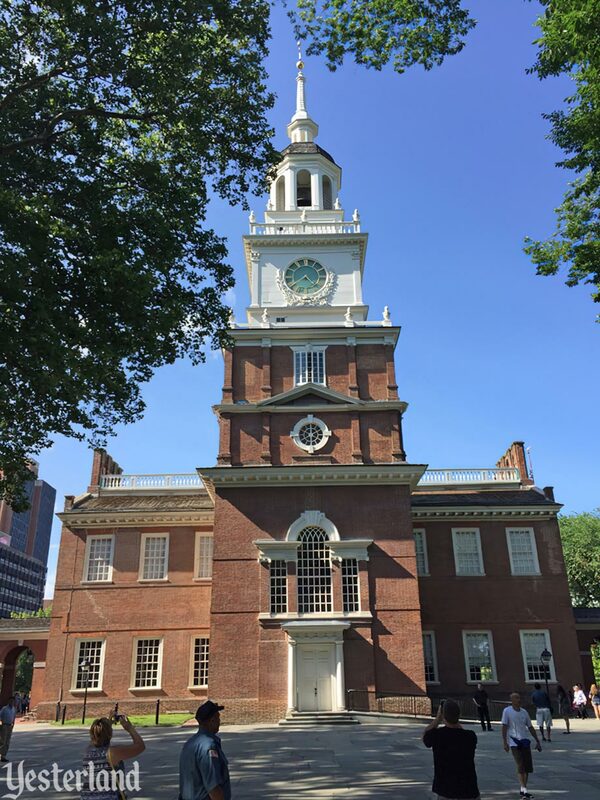 Why build Independence Hall? There are many reasons. It is not only the most historical building in America, but it is one of our most beautiful and stately structures. Our greatest documents — the Declaration of Independence and our Constitution — were both worked out and signed there. Just as Ghost Town vividly reminds us of our gold rush beginnings in California, Independence Hall takes us back to the very founding of our country. Truly, this building is the birthplace of America and the greatest shrine to individual freedom in all the world. 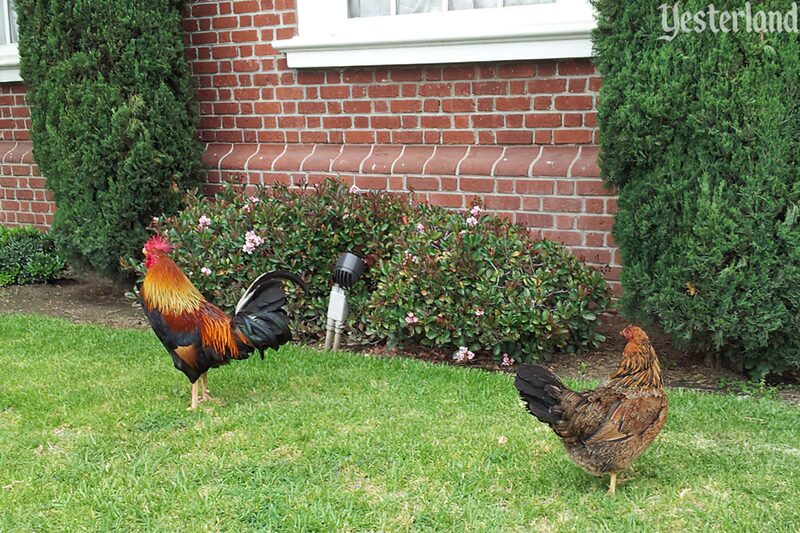 Like Ghost Town, Independence Hall is a milestone in the history of the Farm. It is a reminder of some of the most crucial events in all of our history. The words above are from a 1969 brochure. 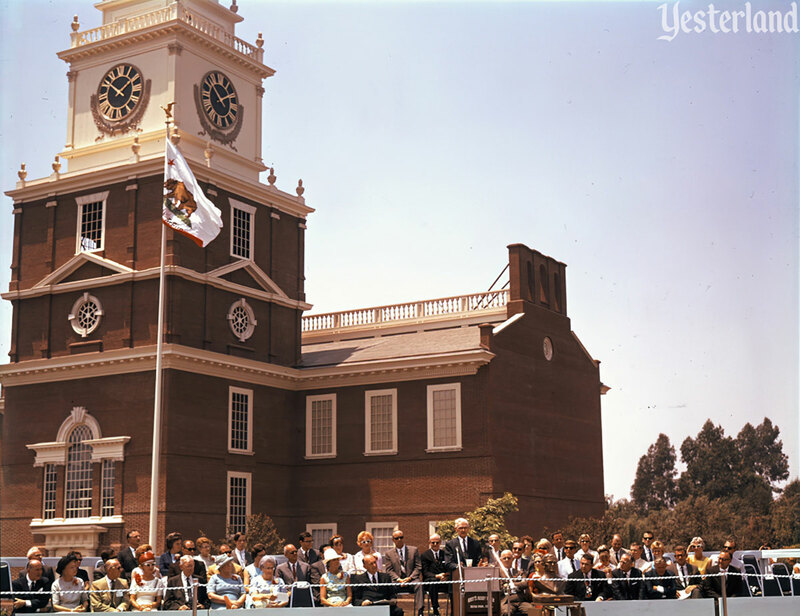 In those days, guided tours of Independence Hall at Knott’s cost 50 cents for adults and 35 cents for children. Conducted by “a gracious young lady in Colonial attire,” each tour began with a short film at Heritage Hall, a separate building nearby. The tour continued to the landmark structure. The first stop inside was the Liberty Bell on the ground floor of the tower, the same spot as the real Liberty Bell in Philadelphia before 1976. Then came the highlight of the tour—the Declaration Chamber—with an audio presentation of the Founding Fathers debating independence from Britain. Independence Hall was built with 130,000 bricks, each with fingerprints and 200 years of weathering, to look as much like the historic landmark in Philadelphia as possible. The replica is 167 feet from ground level to the top of the weather vane. That’s 20 feet taller than Matterhorn Mountain at Disneyland. 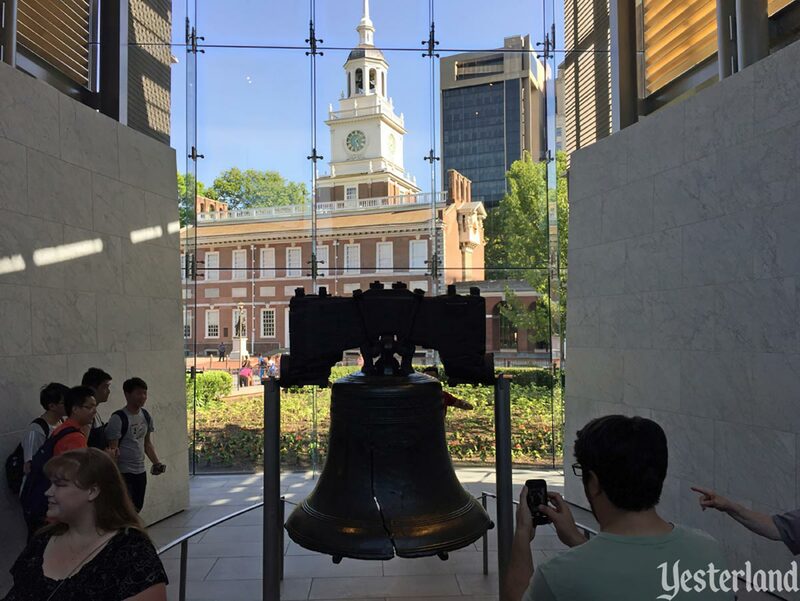 The 1966 version of the Liberty Bell has the same dimensions and weighs just five pounds less than the 2,080-pound original. It was a gift from Bud Hurlbut (1918–2011), the concessionaire who created and owned the Calico Mine Ride and other top attractions at Knott’s. 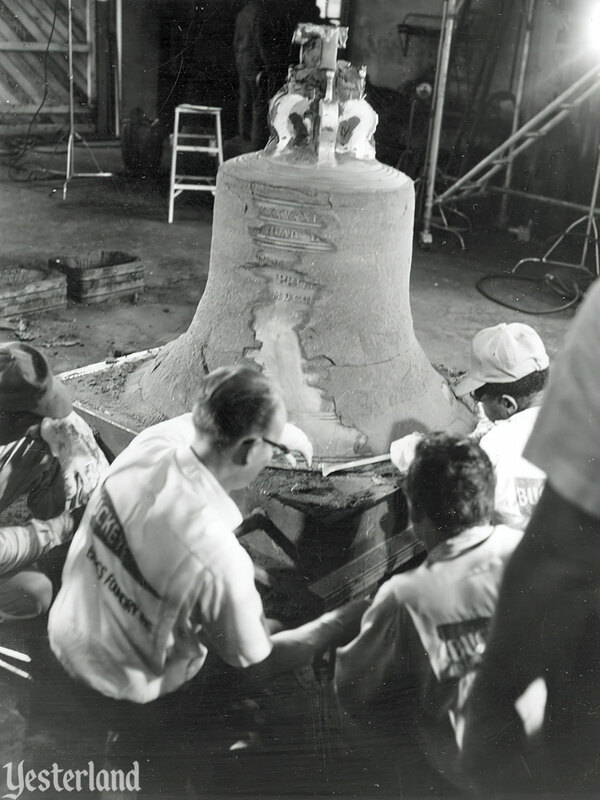 The bell’s foundry used sand to provide a weak spot that matched the famous crack of the original. All it would take would be cold water on the hot metal; the contraction would cause the bell to crack in the right spot. At least, that was the plan. The cold water didn’t work. Neither did a sledgehammer. Or a jackhammer. Even 36 hours in dry ice, although much colder than cold water, failed to crack the bell. 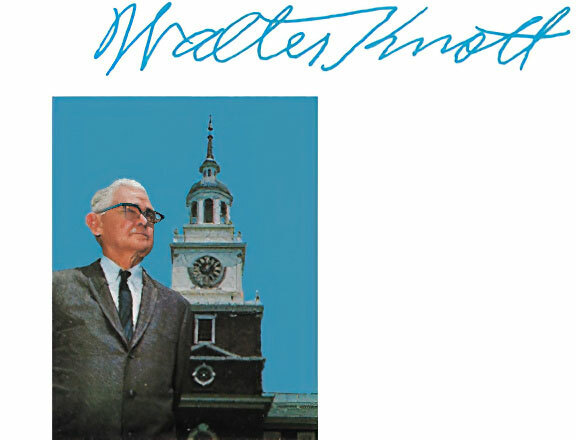 A passionate political conservative, Walter Knott used Independence Hall for political activities. A 300-seat theater on the second floor was not part of the tour. Walter Knott had much to be proud of, but he considered this Independence Hall to be his greatest achievement. It was a dream he had shared with his wife Cordelia for 25 years before it became a reality. When Hollywood needs Independence Hall for a movie or television show, there’s no need for the cast and crew to travel to Philadelphia. 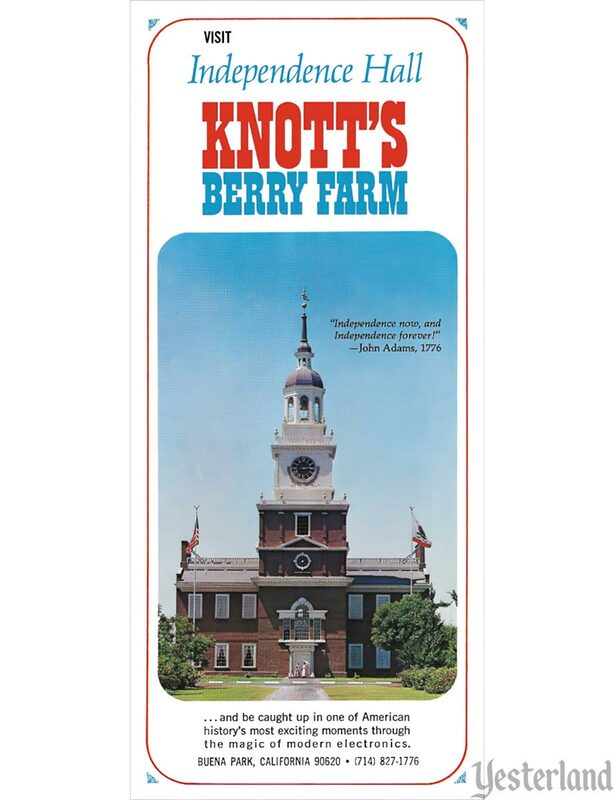 If you watched the musical 1776 (1969) or the action film National Treasure (2004), you were seeing Knott’s Berry Farm. 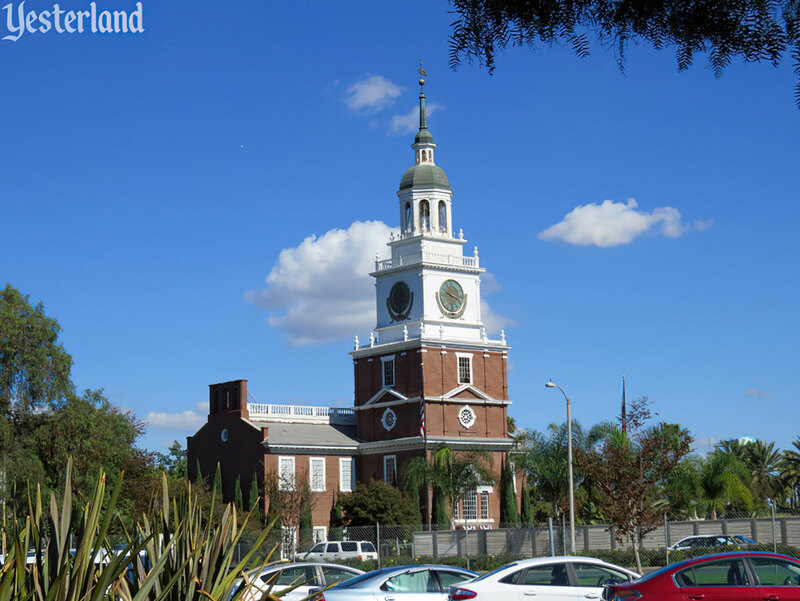 Independence Hall at Knott’s Berry Farm from the other side of Beach Blvd. In October 1996, the Knott family agreed to sell their park to Cedar Fair, L.P. of Sandusky, Ohio. 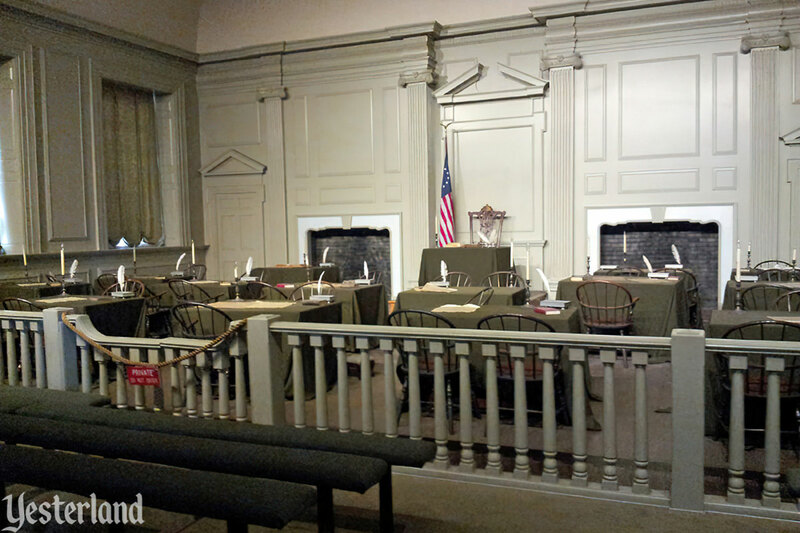 Independence Hall was more than 30 years old and showing its age. 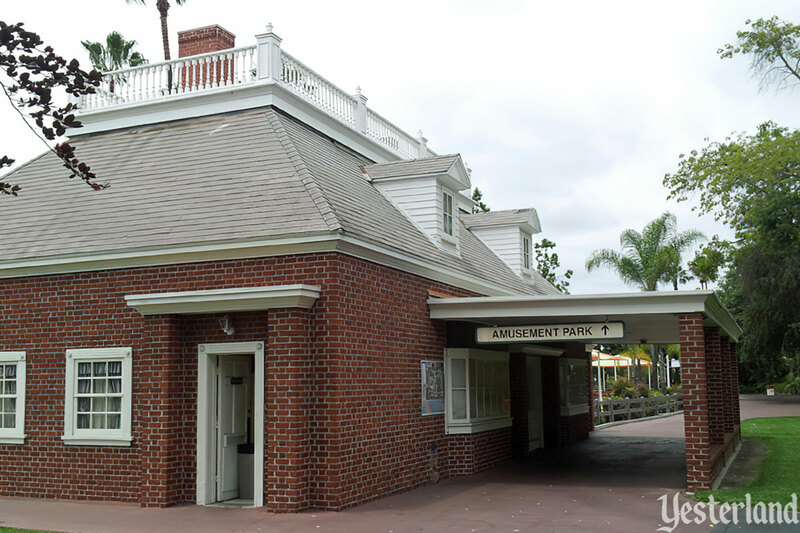 One of the first major projects undertaken by Cedar Fair was to close Independence Hall from April 1997 to September 1997 for a thorough refurbishment back to its Opening Day appearance. 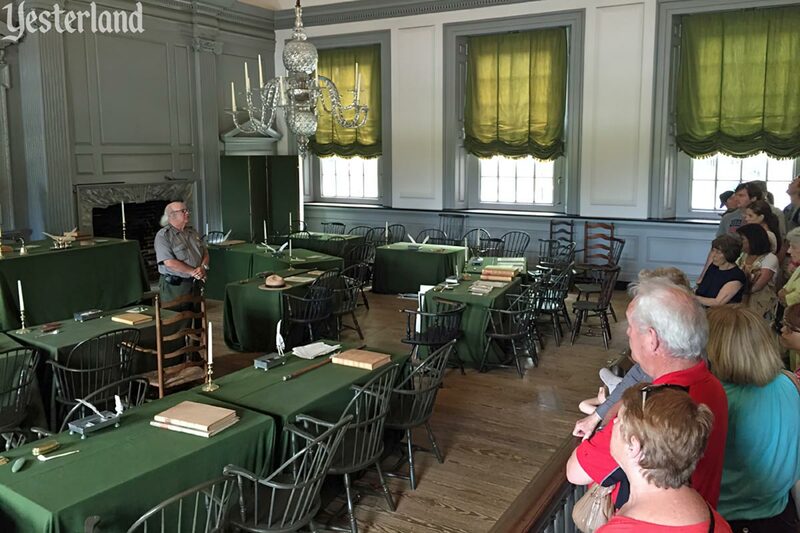 Knott’s no longer charges admission to visit Independence Hall. It’s outside the gated admission area, near the Knott’s Soak City waterpark. Parking is free for one hour without validation or three hours with a food or merchandise purchase. The guided tours are long-gone. Now you just walk right into Independence Hall and explore it at your own pace. 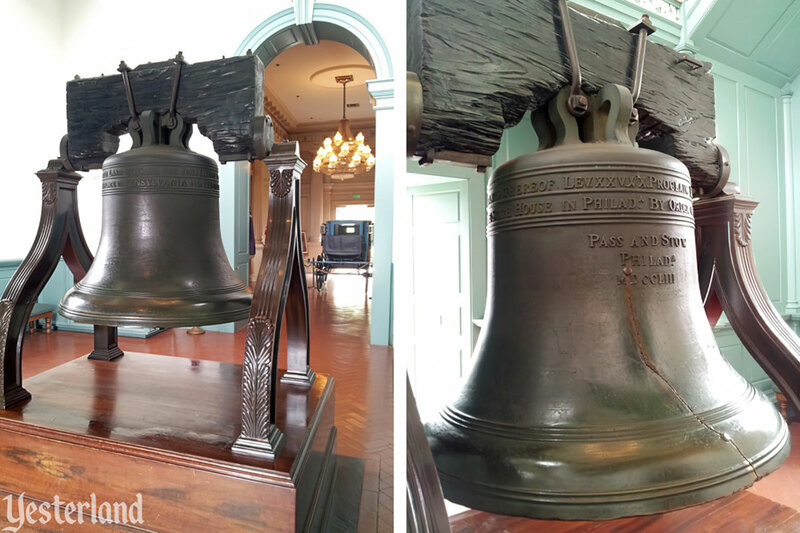 A recording now tells you about the Liberty Bell, still displayed where it’s been since 1966. Back in the 1960s, Walt Disney pioneered Audio-Animatronics to put President Lincoln in front of an audience. Walter Knott took a simpler, but surprisingly effective, approach to presenting American history. The meticulously recreated Declaration Chamber darkens. 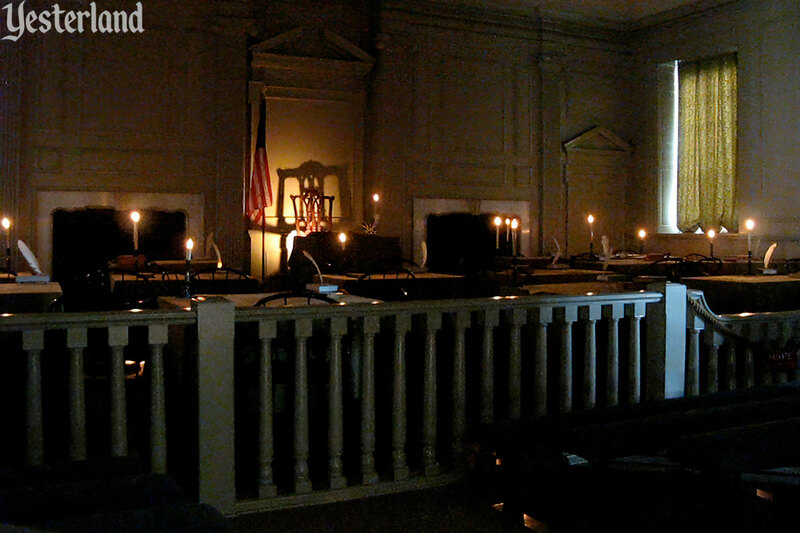 Quills in inkwells on various desks light up as representatives from American colonies who were at those desks debate whether to declare independence. The audio presentation is still surprisingly effective, despite being low-tech. Meanwhile, back In Philadelphia, National Park Service Rangers provide free tours of the real Independence Hall. The Liberty Bell is no longer inside the original Independence Hall. 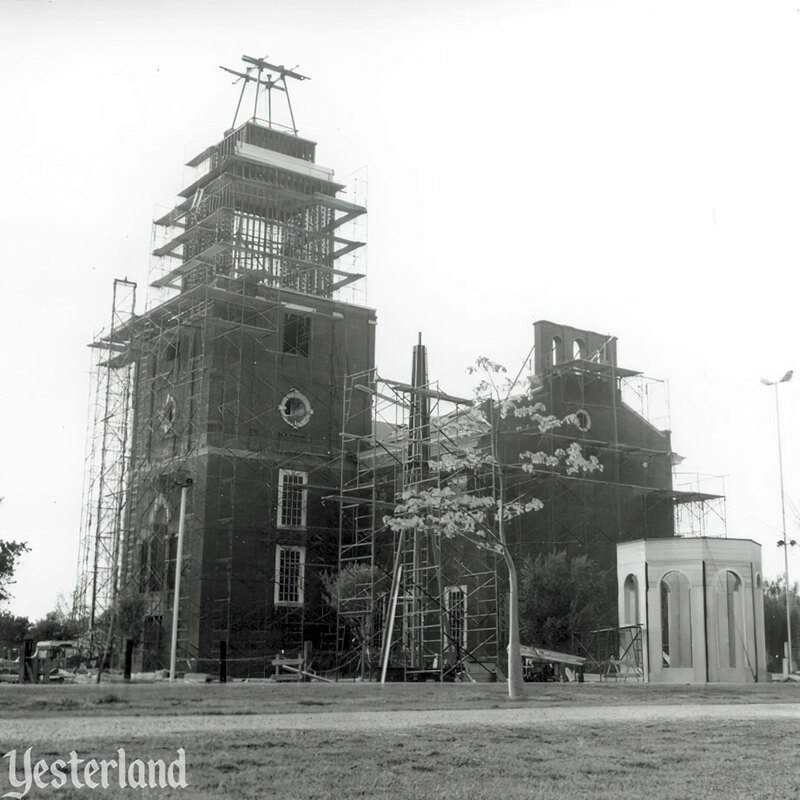 In anticipation of the crowds expected during the American Bicentennial year of 1976, it was moved to its own structure, Liberty Bell Pavilion. 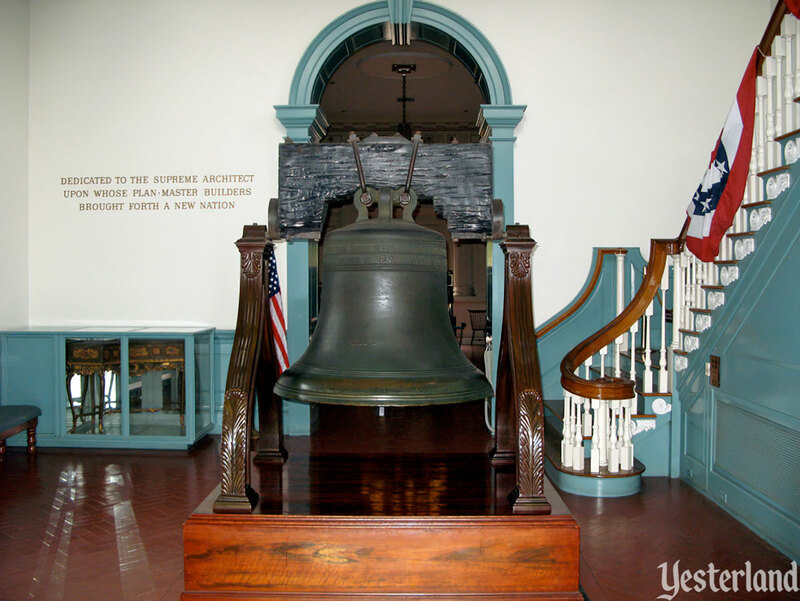 The bell made another move in 2003 to a much larger building, Liberty Bell Center, a museum devoted to the famous cracked bell, its history, and its symbolic significance. Be sure to visit Independence Hall. Pick the one that’s more convenient for you.